I’m bringing a rum cocktail to #SundaySupper this week in a big way. This frozen banana daiquiri recipe is one I’ve refined over the years until it is sweet, refreshing perfection just like a Caribbean cruise! Bruleed banana gives this fun tiki drink a unique punch of flavor. Get ready to relax and dream of warm Caribbean beaches, y’all! When I think of sipping a cocktail I don’t think of leaning on a bar Madmen style — I think of sitting on the balcony of a cruise ship watching the clouds float by and listening to the turquoise water tapping out a melody on the sides of the ship. Of course, you have to listen really close because, depending on where your cabin is, your fellow passengers are often more interested in being loud than listening to the soft sounds of the water. I am one of those immature people that likes girlie drinks. Sweet, slushy, creamy… and served in a tall glass with an umbrella at the top! If they’re a pretty color so much the better! Nah. That would be tacky. The thing is that it more or less lost favor and celebrity status sometime in the late 1970s. The daiquiri purists will tell you that this is not a daiquiri because of the excess ingredients. To me that’s like saying that your mom isn’t your mom because she put on a little lipstick. Sometimes you just have to gild the lily. This frozen banana daiquiri cocktail does just that. A little lily gilding. A little fancy-ing up of the classic rum cocktail. So, classic cocktail aficionados and daiquiri purists you might want to move on. You won’t like what you’re about to see. I don’t drink much on cruises because those cocktails are expensive! I may treat myself to one or two but thats about it. There’s so much to do besides drink and gamble… And who goes on a cruise ship to sit at a slot machine anyway? It’s crazy! Every cruise we’ve been on there are just scads of people sitting in the interior of the ship gambling, drinking, and smoking (it’s usually the only place on board that you can smoke). If that’s what they go to do I don’t understand why they don’t just take the red eye to Las Vegas. It seems like it would be cheaper — or maybe not. It just seems sad to be surrounded by all of the opportunities for adventure and choose to spend your time that way. I’ll tell you though, I had one experience that made me strongly consider staying on board and hitting the casino myself! A few years ago we took the kids that still lived at home on a 5 day cruise to the Western Caribbean. It was my second cruise and the kids’ first cruise and we were really looking forward to the experience. My husband has been on at least a billion cruises but he loves them and doesn’t mind revisiting the places he’s already been. Well, this particular time the kids and I were going snorkeling and my husband was going to take the chance to scuba dive. We went our separate ways and planned to meet back on board for dinner. I have to tell you I was a little nervous about being on my own with the kids but as we got closer to the snorkeling area I got more excited. After a brief introduction and instruction time we went out into the water and pretty much entered a whole ‘nother world. It was so peaceful and SO beautiful! The main irritation was we kept swimming through clouds of minuscule baby jellyfish that you could barely see with your eyes but you’d get these zaps of sting. Once it was over we came back on shore and dried off then shopped for a little bit. Dear Lord, I caught sight of myself in a shop mirror and I looked like the sea witch from The Little Mermaid. My hair hung in wavy strings because it was so inundated with salt and sand, my waterproof mascara had given up trying to stay put and it ran down my face in Alice Cooper-esque streaks of black. My nose was burnt, my shoulders were burnt, and my bathing suit cover up slapped wetly around my legs like a flag in a thunderstorm. I cleaned up the mascara problem as best I could with spit and my beach towel then we headed back to the ship and got in the line to get onboard. I felt like I was doing great at the adulting thing because we were on time AND I had all the kids with me plus we’d shopped and picked out little gifts for our friends. I have an unhealthy fear of being left behind. Being out away from the ship scares me to an extent because I’m afraid I lose track of time and end up on the dock watching the back end of the cruise ship on the horizon line. So being a responsible mom I sent the kids through security first. I confidently stepped up to the security checkpoint and handed them my ship ID. She scanned it, looked at me, looked at the picture that came up on the computer, and looked at me again. Well, my kids’ eyes were as big as saucers as I moved over to the holding area while they stood uncomfortably in the ship, not really knowing what to do. My 18 year old son stepped back to be by my side and my 16 year old took the other three back to the rooms. Well, long story short they called in the head of security for the ship and he let me through. I more or less held it together until my husband got back and when he walked through the door I ended up in a blubbering heap on the floor trying to sob out my story – with my son translating. I treated myself to a cocktail or two or ten that night and I’ll tell you – this frozen banana daiquiri would have been just the thing to soothe my frazzled nerves. The garnish I’ve used is SO cute, isn’t it? It’s super simple, too. I’ll try to get a video done this week so you can see how it’s done. Cut about 3 inches off the bottom end of a banana leaving the peel intact. Slice the stem in two pieces to create the “mouth” but don’t cut into the banana. Use a sharpie to add dots for eyes. Push a maraschino cherry into the mouth. Push into margarita glasses then fill with the cocktail. 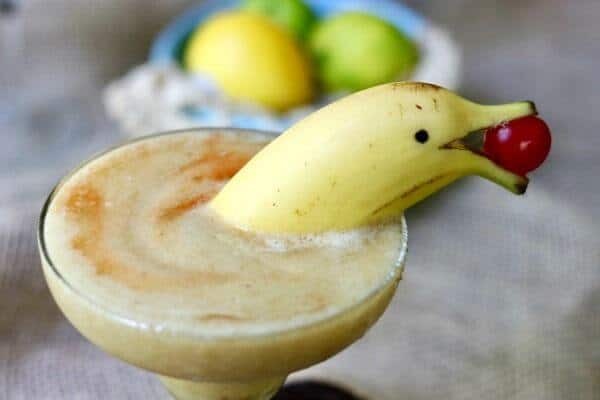 So, this frozen banana daiquiri is a yummy rum cocktail exactly as written but there are a few variations I’ve come up with over the years you might like to try. Everyone could do with a few more umbrellas in their life! Cocktail umbrellas that is… If you never can get your favorite cocktails to taste like the ones you buy then you might be missing the bitters. Too rich and creamy? For a lighter, but still very tiki, cocktail how about this bright, Caribbean blue drink? I have to give a big thank you and a shout out to Christie from A Kitchen Hoor’s Adventure for hosting this week’s #SundaySupper! 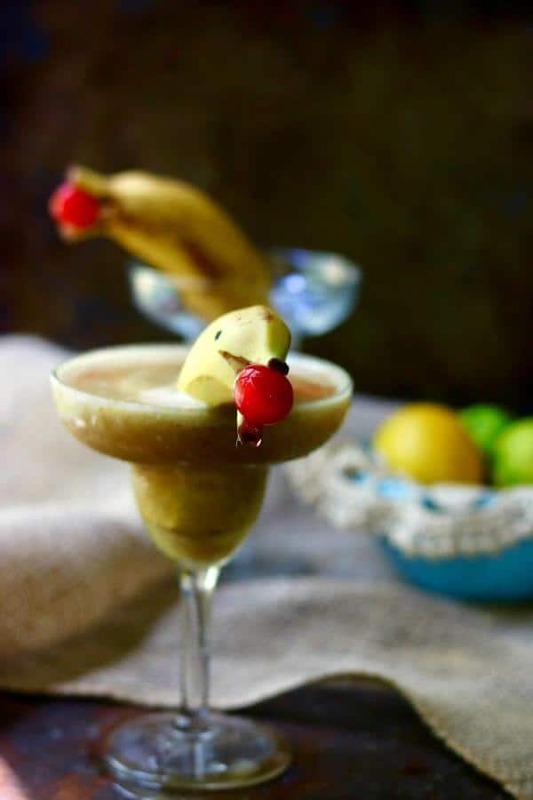 Be sure to check out all the great recipes linked below the frozen banana daiquiri recipe below. 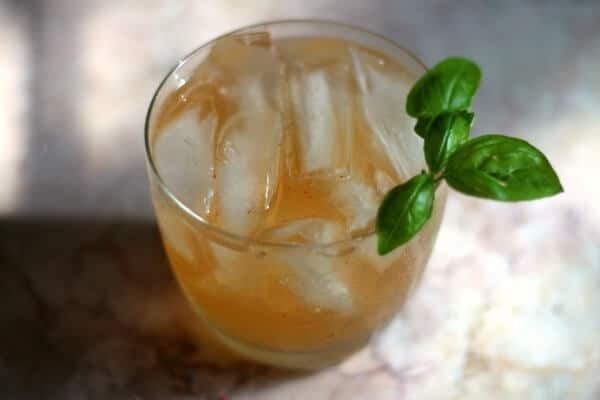 Smooth and creamy, this tiki style drink will whisk you away to warm, sunny beaches and blue skies — even if you’re really sitting in a crabgrass filled yard with your feet in a kiddie pool. Sprinkle brown sugar on the banana. Using a torch, brulee it until the sugar is melted and bubbling and the banana has caramelized a little. Cut into chunks and freeze. Combine all ingredients except the dark rum and Angostura bitters in a blender. Blend at low speed for a few seconds then high speed until smooth. Finish with a float of dark rum and some Angostura bitters, if desired. 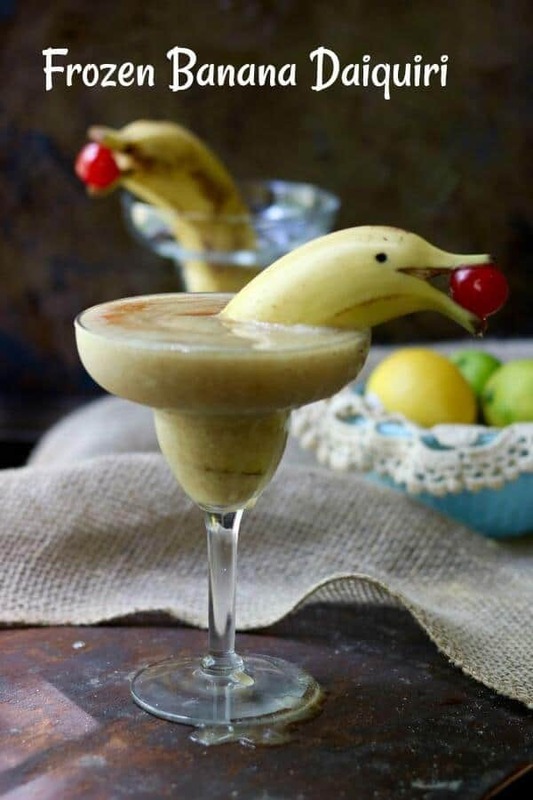 The dolphin banana garnish is EVERYTHING! Also I am anxious just reading your story and avoid the water and cruises and boats at all costs. LOL! I love cruises… that’s just the weirdest thing that ever happened to me! 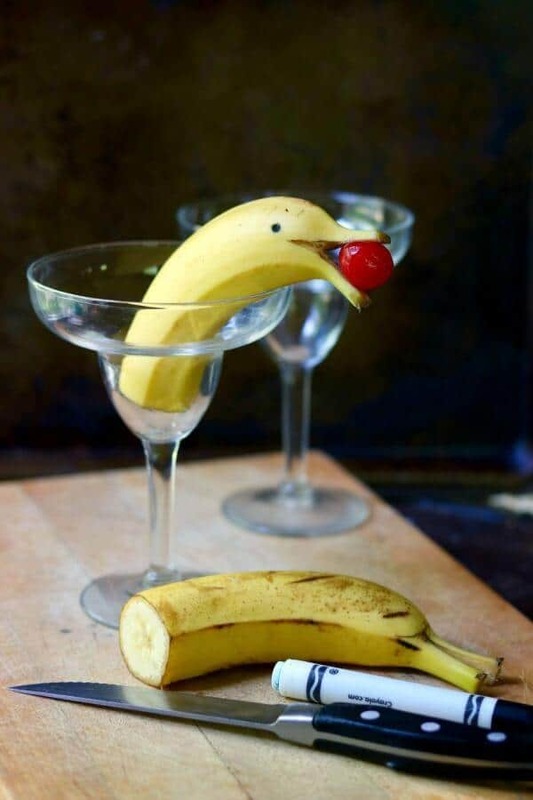 I am a huge fan of banana, but I have never had a banana daiquiri! I love your clever presentation! Oh my you are a good story teller! Love your dolphin too! Thank you Denise! Well…I’ve got a lot of words left at the end of the day I guess! First of all this is adorable. Secondly, I loved your story and your description that you looked the the Sea witch–that is how I look after the beach myself. Thanks Kristen – it was fun to make… and yeah… I’m never going to be mistaken for one of the characters on Bay Watch. 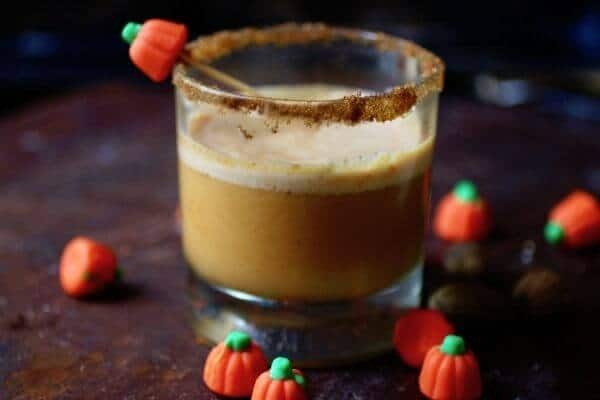 Oh my goodness, I can just feel how your stomach must have dropped when they wouldn’t let you back on that ship…..Makes for a good story now and a great segue to this drink recipe. This one is calling my name! So much fun and flavor going on!! Thanks! It was SO good. 🙂 AND so much fun to make. The garnish is adorable, and I’m completely intrigued by the Chipotle in adobo in the drink. It’s one of my favorite ingredients. Your garnish is adorable! I’ve never had a banana daiquiri. I have plenty of frozen bananas…. I should use them and make these. You have to do the brulee before they are frozen but you could make it without bruleeing the bananas. 🙂 It’s so good. OH, my gosh!! What a story! So glad you made it back on the ship. 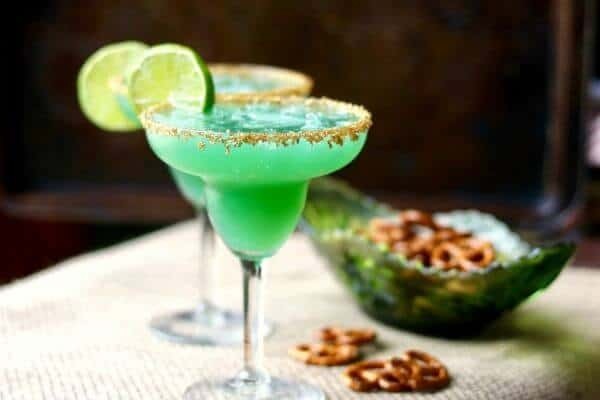 I would have needed a gallon of these frozen daiquiris after that incident 🙂 LOVE the garnish—it makes the drink!! Well it’s a fun story to tell now but it wasn’t so fun then! Thanks Liz!